A Flying Start to the New Year! 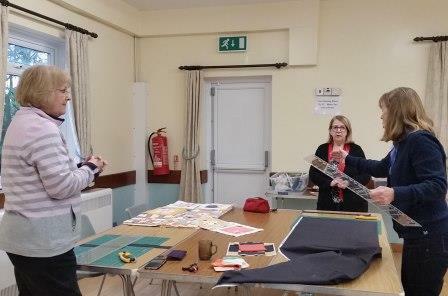 The first CE session got off to a flying start today with great enthusiasm to be involved in various projects that are on the go. 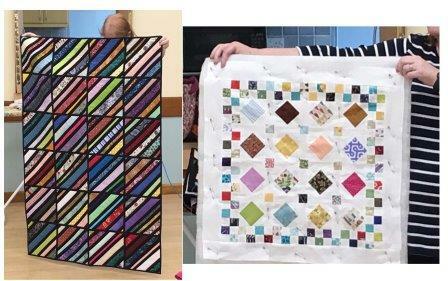 In the far corner of the room a small group worked hard during the day to prepare the Project Linus blocks for quilt as you go and were extremely grateful to those who offered to take a strip home to sew them together. 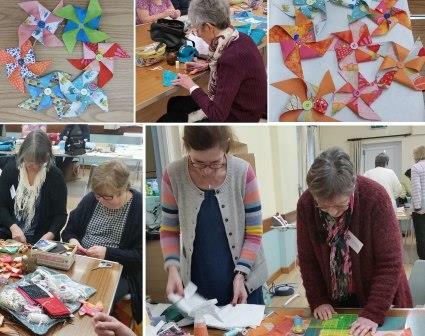 And there was great enthusiasm to make the fabric windmills for the Swansea Festival of Stitch exhibition which takes place in August. What wonderful a splash of colour they are going to make. 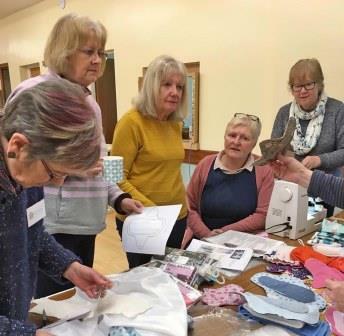 Many thanks to Sally for bringing her fabric stash along for us to use and many thanks to those who bought some of the fabric. 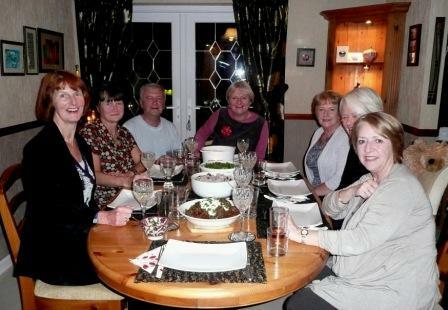 £87 was raised which Sally plans to donate to a breast cancer charity. 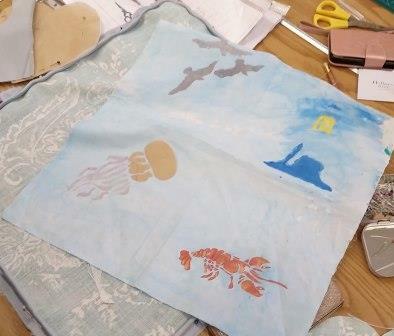 Others were busy on various project – many of which are sea themed – I wonder why!!! 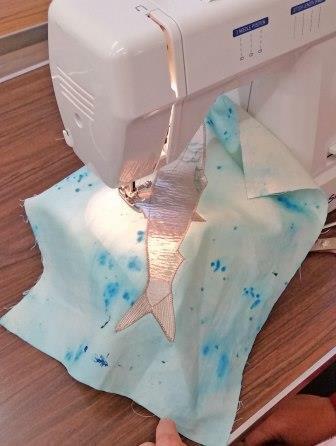 Sally was sewing a fish which some lovely fabric that she said used to be her sister’s curtains! 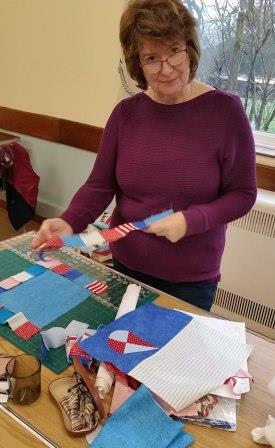 Our guest Janet was busy making fabric windmills in a quilt as you go technique – what a coincidence! 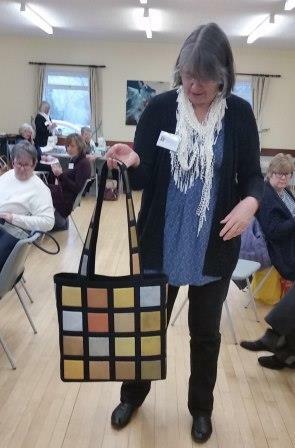 Fiona showed everyone a beautiful bag she had made – it looks as though it is quilted but but the panels are painted! A busy and productive day. Many thanks to everyone for their support which, as always, is very much appreciated! 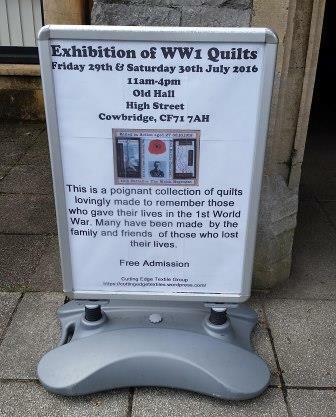 As part of their tour to mark the Centenarary of the First World War our WW1 quilts were recently (29-30 July) exhibited in the Old Hall, Cowbridge. 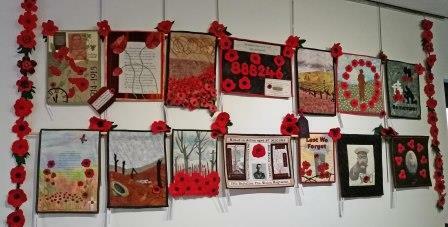 Visitors were able to view 23 small quilts – a number of which were made to remember a relative who died in the war. What a memorable exhibition it was. There were just short of 500 people visited the town over the two days to see the exhibitions. 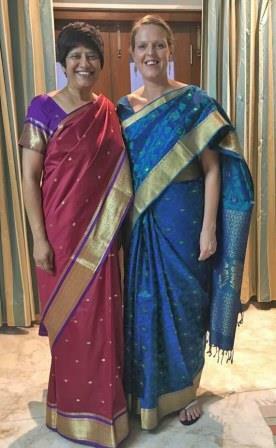 And two of those who passed through were from New Zealand! 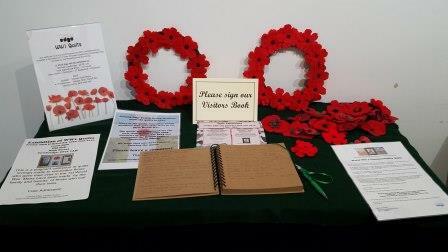 Visitors were invited to mark their visit with a comment in our visitors book and we plan to share some of their comments here soon. 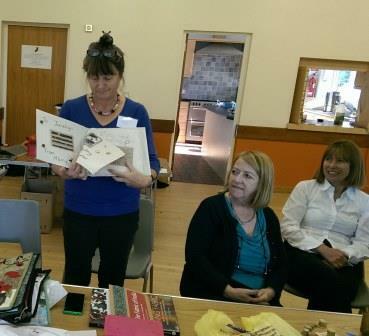 The book will also be available at group meetings for members to view. 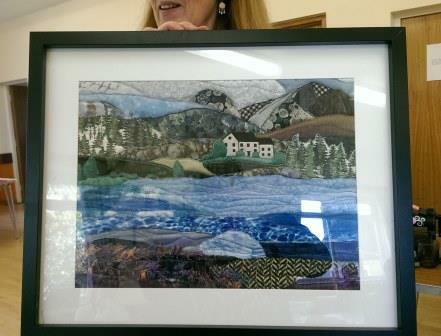 It was a stunning display beautifully created by Liz Price, Chris Dobson and Yvonne Davies. Many, many thanks to them for so generously giving their time. 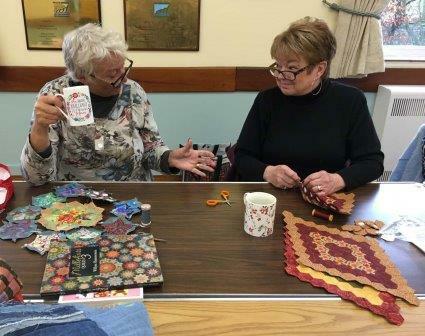 We are also extremely grateful to David Howell and his colleagues from the Cowbridge Branch of the British Legion who very kindly looked after the quilts for us throughout the two days. 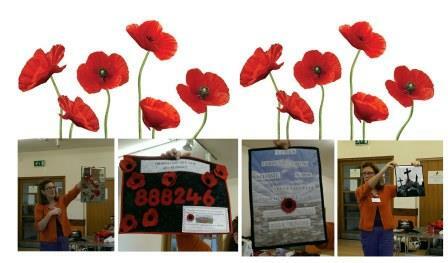 And in the process raised £270 for the charity by selling commemorative badges. 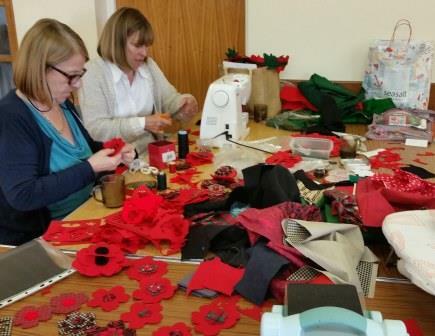 It was all hands on deck yesterday at Cutting Edge to make poppies for the forthcoming display of the WW1 challenge quilts in Cowbridge shop windows (Beauty Within, The Barbers Cowbridge, Costa Coffee, Ty Hafan Emporium, David Barnes Dry Cleaners). 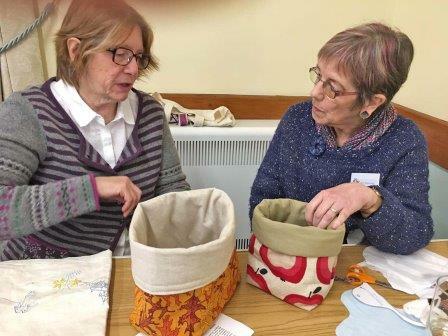 A BIG thank you to all those who gave their time – your support was very much appreciated and you will be pleased to know we have loads of felt poppies! 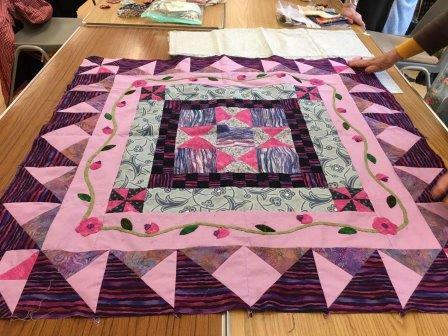 Yesterday was also the day that the completed WW1 challenge quilts were handed in – a wonderful collection – those involved have done us proud! 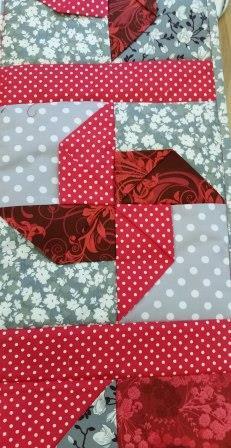 Below are a small selection of the quilts that have been submitted. 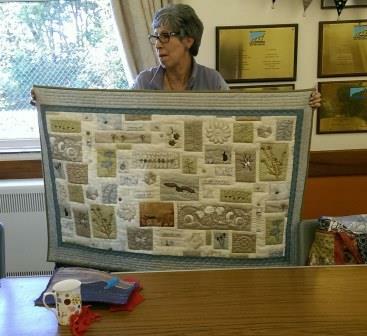 Photos of all the quilts that have been completed so far (and we look forward to more) are posted on our dedicated WW1 page. 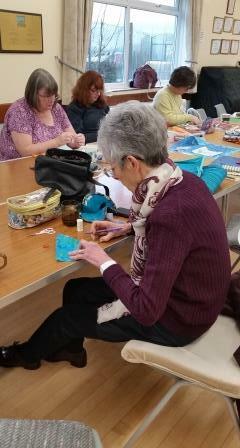 Now that it is evident that members are up for a challenge Monica wondered whether they would like to take up the challenge of making something out of a bag of 1 inch squares – a bit of a bridge too far maybe??? 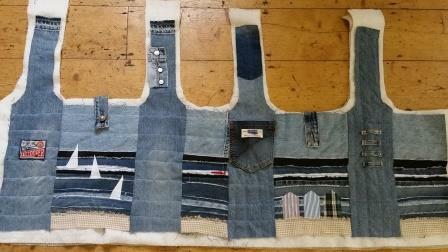 In addition to the above we had lots of news to share and many pieces of work to show. 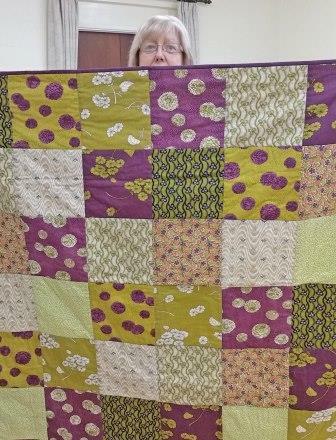 Jeannie Duncan Farr brought in a beautiful whole cloth quilt that she has recently completed. 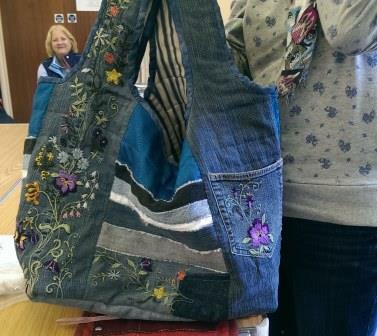 Some members had brought in the denim bags they had started to make at a workshop on Saturday and Jan Webster had finished hers – beautiful embroidery – what a stunnng pair of jeans they must have been. 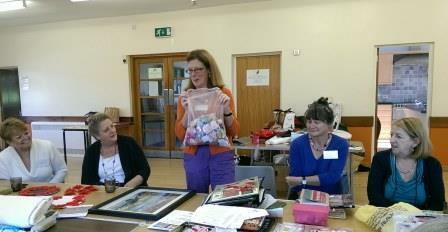 Dianne showed some amazing knitted articles that she had made. 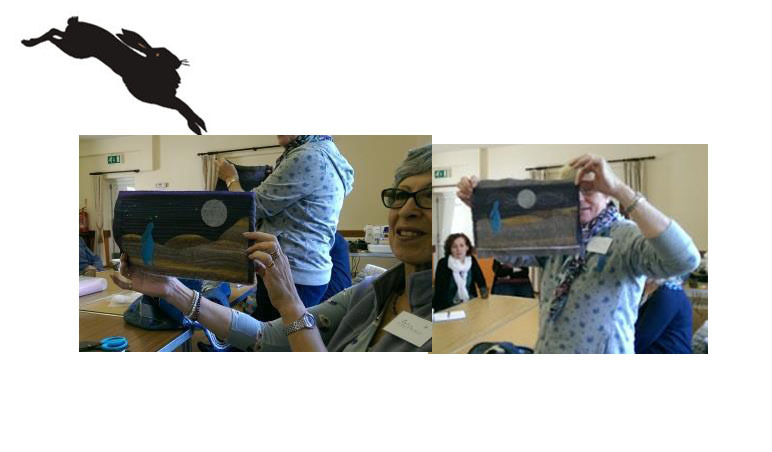 And, Gilly and Jan showed pieces of work that they had done at Deborah O’Hare‘s moongazing hare workshop. 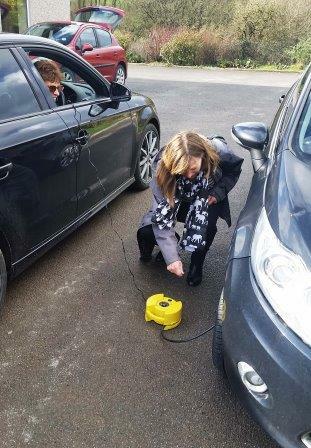 A busy but enjoyable day – looking forward to next month already! 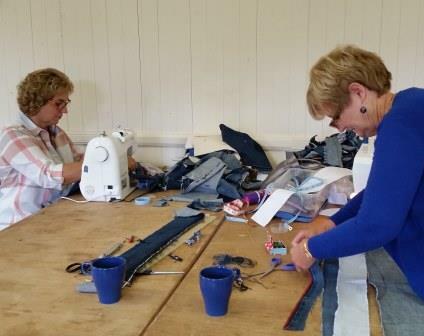 On Saturday 10 October a small group of sewing enthusiastics met – on a mission to make a bag from recycled denim jeans. 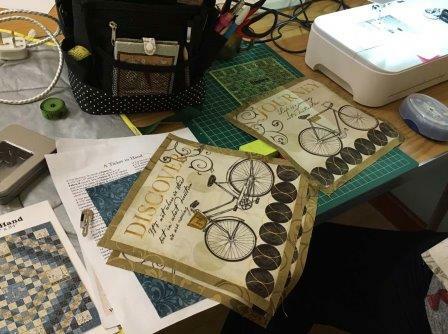 The group were guided through the process by Sue Atkinson who had been given permission by Ineke Berlyn to use one of her designs. 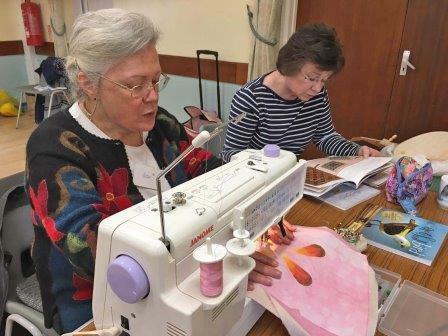 And, by the end of the afternoon everyone was well on their way with the basic structure completed and plenty of embellishments in place. 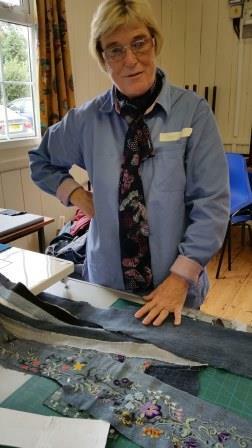 And, there was much admiration over Jans use of a beautifully embroiderd pair of jeans that she had used…. 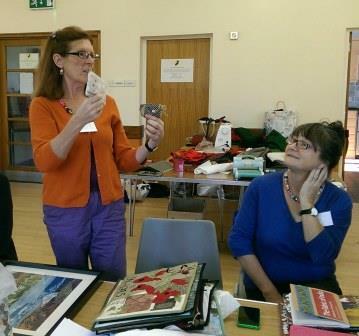 Many thanks to Sue for such an enjoyable day! 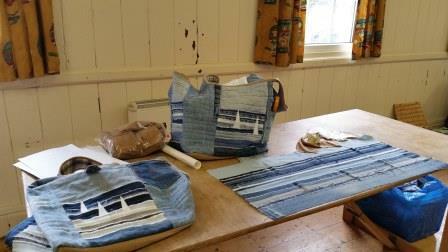 And, hey presto – here is Jan’s finshed bag! 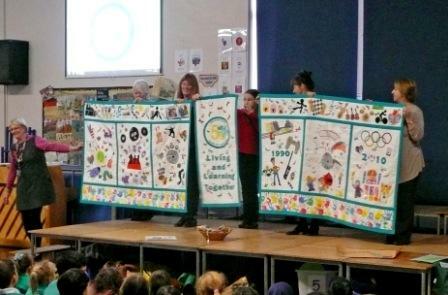 Thursday 8 November was quite a special day because it was the day we presented the 50th anniversary wall hanging to Lakeside School. 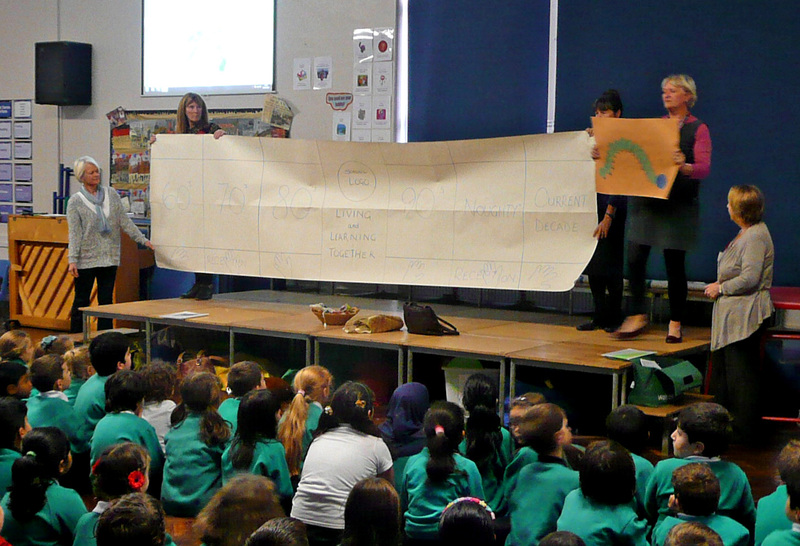 First of all we reminded the children of how the project got underway, rolling out the paper template that was prepared and first shown to the children in March. 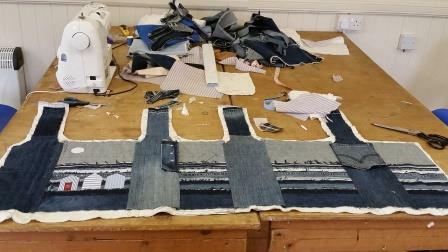 Then the big moment – the finished article! 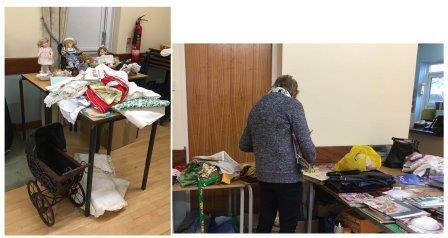 It was lovely to see the reaction from the children – lots of oohs and aahs and pointing out the bits that they had been involved in making. 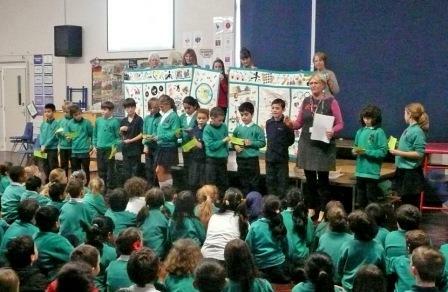 Ths school council was then enlisted to run a competition – the children were invited to count or guess how many dragonflies were on the wall hanging. 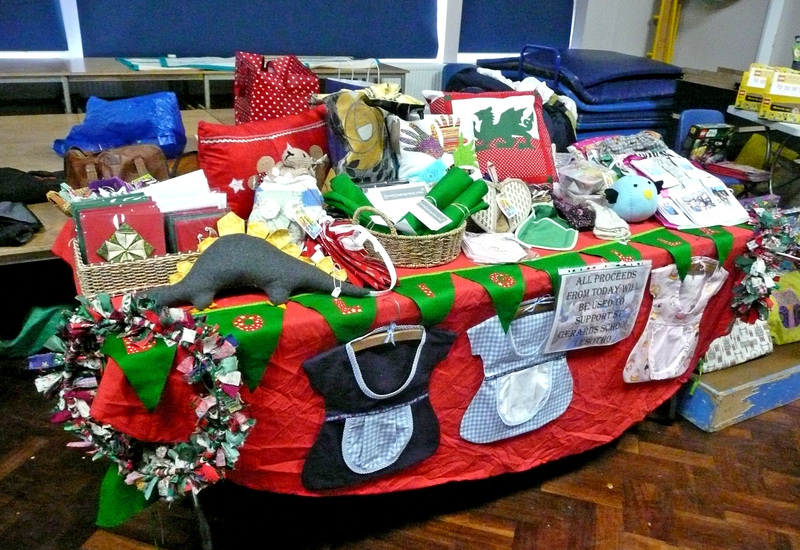 We then took part in the school’s Christmas Craft Market to raise some more money for the school children in Lesotho, South Africa. 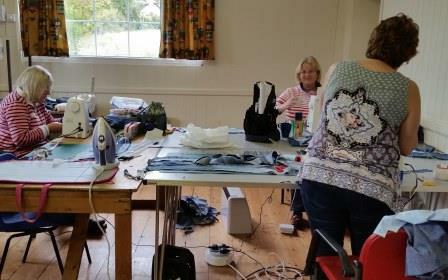 And we were thrilled when we realised that we had raised £150! 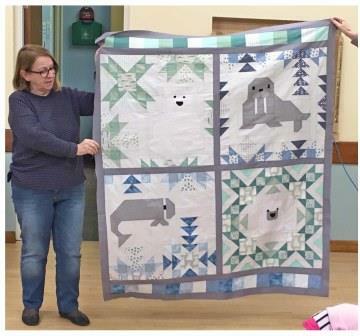 Adding that to the money that we raised with an afternoon tea in September and numerous individual donations the total raised is now around £900! We all agreed that we had a lovely day, made very welcome by everyone, treated to a lovely lunch and the whole day was finished off with a yummy supper, courtesy of Monica’s husband! 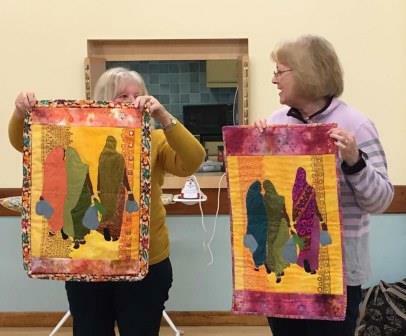 The wall hanging created by children from Lakeside Primary School Cardiff and some of the members of the Cutting Edge group is finished. It will be presented to the school on Friday 8 November 2013 at a special assembly. 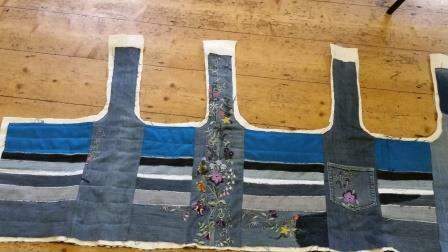 The wall hanging has been created to celebrate the school’s 50th anniversary. Each year group completed a decade panel and the reception children provided the hand prints. 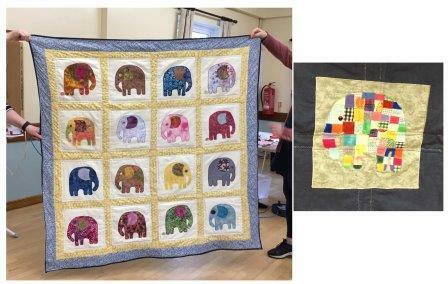 The panels running across the top of the wall hanging reflects the many school clubs, the work of the Parent Teacher Association and the links with St Gerard’s School, Lesotho. The school’s anniversary logo and mission statement is on the central panel and dragonflies (which are part of the school’s logo) are peppered throughout the wall hanging – a bit like a Where’s Wally effect! We wish the school a very happy anniversary and hope that they like their new acquisition.